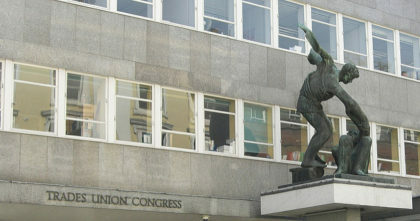 The 148th annual UK Trades Union Congress will be held this year in Brighton from September 11 to 14 — and will include a vote on whether to endorse universal basic income. The largest member, Unite, endorsed basic income this past July. It has now introduced a motion supporting basic income for consideration at this year’s Congress. Congress notes the growing popularity of the idea of a ‘Universal Basic Income’ with a variety of models being discussed here and around the world. Congress recognises the need for a rebuilding of a modern social security system for men and women as part of tackling poverty and inequality. Congress believes that the TUC should argue for a progressive system that incorporates the basis of a Universal Basic Income system paid individually and that is complementary to comprehensive public services and childcare provision. Congress believes that such a system would be easier to administer and easier for people to navigate than the current system which has been made increasingly punitive and has effectively been used to stigmatise benefit claimants. The operation of sanctions pushes people into destitution for trivial reasons. Congress recognises that until the housing crisis is resolved there would also be a need for supplementary benefits to support people on low incomes with high housing costs and that there will always be a need for supplementary benefits for disabled people. The transition from our current system to any new system that incorporates these principles should always leave people with lower incomes better off. Congress believes that our social security system must work in tandem with our agenda for strong trade unions and employment rights and secure, decently and properly paid work. Photo CC BY-NC 2.0 Toban B. Now that our ever-expanding GDP has reached the multi-trillions of dollars range here in the USA, the judicious insertion of money into the economic system becomes a major priority. Federal governments reserve the right to create money. Money doesn’t sprout up all by itself, like the leaves on a tree. It must be produced and introduced into the economy. Money isn’t wealth, per se. It’s more of a “tool” that measures and transports the wealth. Wealth, (i.e., GDP) is more and more people, producing and consuming more and more things. Present-day banking transactional fees collect the available money “tools” out of the flow of the economy faster than ever before. We live on this planet that’s in a “Goldilocks Zone,” where things are “just right” to support life as we know it. For us, keeping things just right is the key. Making it possible for each individual state, (where the people live,) to disburse New Money Grants to adult members of humanity would be one way to get things just right and to keep the expanding economy on an even keel from now on. Calling this a: Goldilocks Economic Monetary Adjustment, (GEMA,) for the GDP, sounds good to me. The term “Basic Income Plan” is a bit of a misnomer, I think..